Understanding each other, having the same objective and what kind of outcome you want to achieve together. Hey Aliff. How’s it going, man? You are quite well–known on LinkedIn as the recruiter with the Afro hair. Can you share with us about yourself and your journey in becoming the Afro recruiter? How I became an afro recruiter, of course, there will be two parts; afro is where I’ve been doing nothing – I just let my hair grow and it became this and that’s my journey to becoming the afro guy but to become the afro recruiter is like coupling that journey of afro guy and how I became a recruiter. Well, that has been sorted out on the unusual moniker on LinkedIn. Can you elaborate more on the recruitment journey part? I started off in 2013 in a recruitment agency where I didn’t know what I was doing and the first line I heard from my hiring manager on my first day was ‘this job is a sales job,’ and I didn’t like it though, so I gave it a go for one month – if I can really do this I’ll stay, if not I’ll just go but then I understand what it really meant. It was all about selling – not selling products but selling jobs. It took me about half a year to adjust and I plan to stick to this line of work and inject some creative environment to this line of recruitment. In some places where I worked at, it was so corporate – no ideology, no fashion sense and no individuality and as a young punk in a corporate attire, I had a thought that this job is significant in the front line especially in hiring talents, so if I can control this area and make it more interesting, why not? I became the trendsetter in the company in my own field – I look at it seriously but deal with it casually because at the end of the day it is my deliverable, which then will translate to the growth of company indirectly and that’s important. How do you attract talents to come and work in one’s company? Over the years when we talked about the new injection of technology, in whatever area we are in, we need to raise the bar in terms of excelling the work – making sure we are using modern platforms. In recruitment, you can never go wrong and you need to look at recruitment in such a way that it is like marketing. When you market recruitment, you need to incorporate the value proposition and of course the employer brand. This is to spark the interest and wanting to know more about it. If you are doing it right, the interest will be there and people will talk about it – you need to “rara” about the job, the company and the brand and of course you need to make sure it is continuous. It’s okay if you don’t land the job but because of the way you approach and market your brand, people will still say good things about you. You have shared about your journey into recruitment with us but what inspired you to empower others especially the youngsters? At any point in your life and at any level, you need to take charge and be responsible and make sure whatever you are doing will impact others otherwise you are just living your own life. I think with that in mind, I will try my level best so that people around me can feel my presence on my contributions and impact. It starts off with your presence then what is your presence going to do. If your presence is not doing anything, might as well you don’t have to be present. When it comes to empowerment, my belief is at the end of the day, it is more of having a good relationship, understanding each other, having the same objective and what kind of outcome you want to achieve together. I used to work with this one junior staff and she was clueless, not knowing about recruitment first hand – frankly I didn’t realise that I can do that; coaching and mentoring and making someone feel empowered until this person told me that I am actually teaching and that point onwards in my life, if someone can tell me this, that I am able to do this, I am sure that person now is becoming more and more responsible. Do it right because it’s an honour to empower someone. How do you get the best out of them? Life 101: employment is part of life. You learn through mistakes, commit mistakes but try to avoid the same mistakes – you mitigate errors. We are in the phase of discovering. Go ahead and do mistakes. Drop it, live it. Move on. There needs to be a cut-off point, and he or she may not have that level of competency yet. It’s a bet because you don’t know about them. It’s okay for them to make mistakes because somehow you need them to develop. Don’t be afraid to take the risks. Trust is key. There are several other youngsters who look up to you as both a leader and a mentor. What is your opinion on this? I’ll give an example of a young lady that I used to mentor. Yes, she was stressed and came to the point that she became unhappy with the way things were managed but in due time, she was given the opportunity to explore things and experience the reality of the working world. The point here that I’m stressing here is perseverance. I gave her my trust and the option to develop, experience and learn from her mistakes and she persevered. That kind of trait naturally comes off from the person you’re giving empowerment too. It is the sense of belonging and the urge to show competency and having the grit to deal with things. How do you relate empowerment to personal branding? How do you communicate your own personal brand? I need to be more casual and hype in my area of work. My area of work requires me to have my own personal branding – a recruiter branding. I need to hire people, attract talents in any possible way I can. 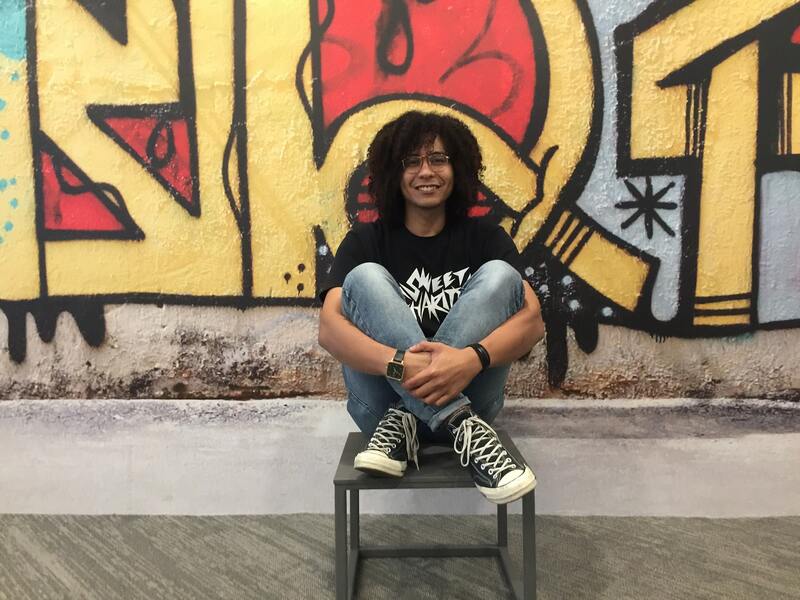 Maybe some people have seen me as the Afro recruiter and that empowered me to grow my hair long and be who I am. It is like letting go of the creative juices in me in positioning myself as a person to deal with the talents out there. It helps me to be more fancy, laidback and vibrant. I would say that I wouldn’t want to be normal – being not normal, engaging, capturing the eyes and by using urban words. Malaysians are pretty much the trend follower’s type. It’s that sort of trend culture that makes us embrace the way we represent ourselves. Do you think this can play a major role in personal branding? No. I’m not following the trend. I could be the trendsetter but not a trend follower because “aku poyo” [I’m cocky]. I guess if everyone is going right and you are going left, there is an element of rebellion for a good cause. At the end of the day, you are known for who you are. If you’re not a pioneer, you don’t talk about how that’s your personal brand. I guess as a recruiter it somehow has crafted me to become a person who needs to deal with any element of life humanely. My former leader told me that ‘if you like what you do, wonders would happen.’ I take it and instil it but for me to complement that quote, I would say just have grit in whatever you do and rock and roll!